Bangkok (Thailand) – November 30, 2017 (travelindex) – Looking for some unique Christmas gift ideas for this Winter? Just grab your friends and head over to join in “Winter Gifts Fair” at RCB Artery, 1st floor, River City Bangkok during 8 17 December 2017 starting from 10.00 hrs. – 22.00 hrs. The event offers a wide variety of gifts and souvenirs at over 30 booths. 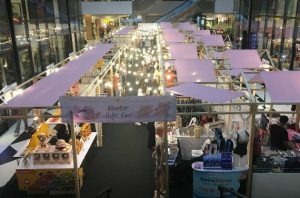 Products include various types of cell phone cases and cell phone finger holders from Sayaa Gadget, chic handmade handbags from Indy Bag and Jonathan Lepkins, fragrances, bedding products, accessories, cotton clothes, linen clothes, dried fruits, bakeries, stainless equipment and many more. It’s finally winter break, a perfect time to chill, relax and enjoy Chaophraya river’s scenery and cool breeze with various menu of food and coffee and buy some New Year’s gifts for your beloved ones in Winter Gifts Fair.